Left to right are Mrs. Gertrude Martin, retail saleslady; Jay (Pappy) Whitaker, father of the proprietor; John T. Whitaker, proprietor; Chester Riley, wholesale route salesman and Wayman Ridgeway, baker. 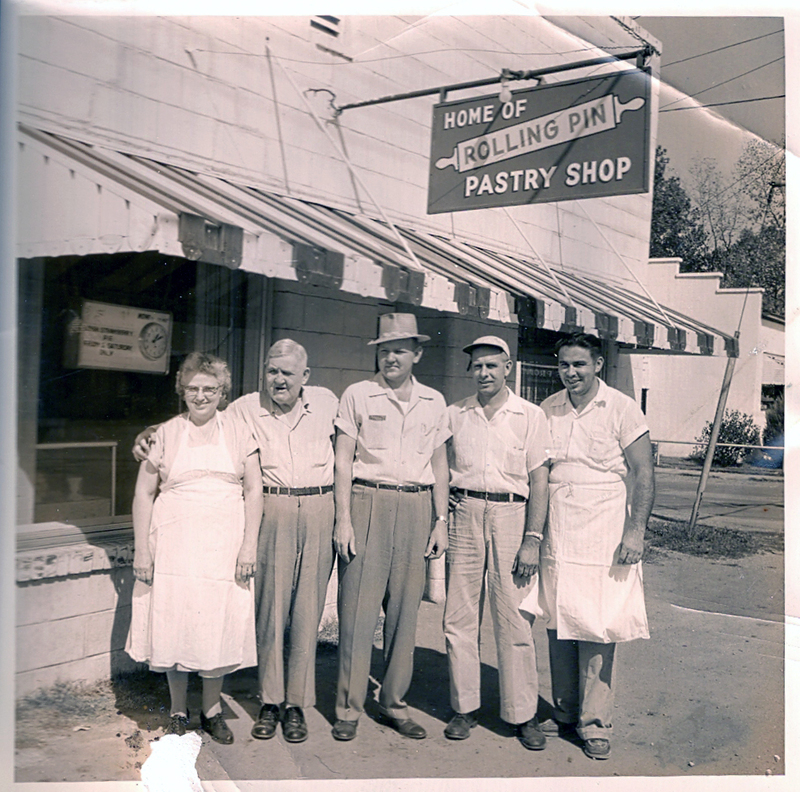 For over 70 years, the Rolling Pin Pastry Shop has been a staple in the Owensboro community. Kathy and Roger Farmer are third generation owners of the Rolling Pin. It was early 1947 when 2 guys, Stuart Whitaker and Joe Henderson, returned from the war. 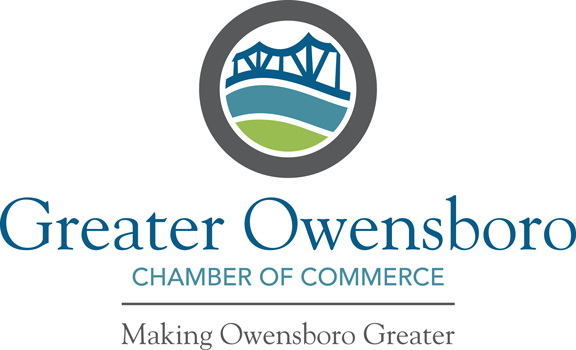 They had an idea to open a little bakery called the Rolling Pin on St. Ann Street in downtown Owensboro. Within months they became disenchanted with the bakery, and sold out to Jay (Pappy) Whitaker (Kathy’s grandfather). The building’s owner wanted the space for a furniture store, so by late 1947 the bakery moved to a brand new building we still call home on East 18th Street. Mary Edith Whitaker (Kathy’s mom) recalls that the business struggled at first and Pappy convinced his son John (J.T.) to join the bakery full time in late 1947. J.T. quickly learned every aspect of the bakery business, working long hours. Within a few years, they bought the bakery from his dad. 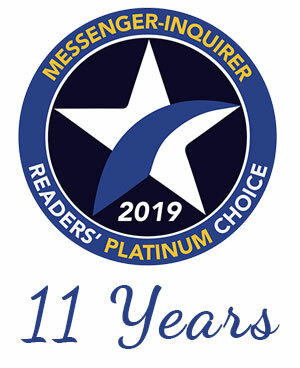 Mary Edith remembers many lean years as they became established, but soon they developed a great reputation. J.T. and Mary Edith operated the Rolling Pin until their retirement in 1983. All of J.T. & Mary Edith’s children helped at the bakery at some time when they were growing up. Kathy remembers going to the shop after grade school and helping make donut boxes, sweep the floor, and clean the showcases. She says it was always fun to “watch her dad decorate cakes and play with his cake decorating tools,” her early introduction to the skill. Later she worked there when home from college during summers and holidays. Roger got his start at the bakery icing donuts, during summers when home from college. After graduating, he returned in what was intended to be a “temporary” job delivering donuts. He took to the business quickly, soaking up J.T.’s knowledge. By 1983, Roger had found his calling and convinced Kathy that they should buy the business when her parents retired. They took over operating the shop in January 1984. The tradition continues. 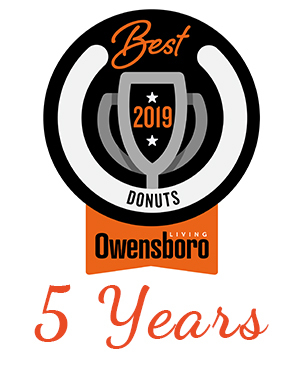 The Rolling Pin has been honored with numerous awards, including the Reader’s Choice Award for Best Bakery 2009-2018 and the Best of Owensboro Best Bakery 2015-2017 and Best Donuts 2018.